The following obituary was taken from the Beckley Post Herald, dated Saturday, August 13, 1977. Meadow Creek - Services for Alfred J. Bailey, 70, will be at 2 p.m. Monday in Ronald Meadows Funeral Parlors in Hinton with the Rev. C. H. Martin in charge. Burial will be in the Meadow Creek Cemetery. Bailey died at 12:30 a.m. Friday at home after a long illness. 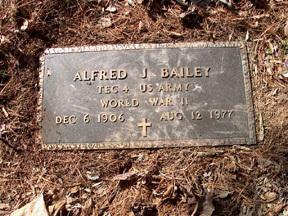 Born Dec. 6, 1906, at Anstead, he was a son of the late James Edward and Elizabeth Hamilton Bailey. Bailey, formely of Cleveland, Ohio, had lived at Meadow Creek seven years and was employed by the River Terminal Railway Co. in Cleveland, having retired as a yardmaster. He also was employed by the Chesepeake and Ohio Railway Co. Survivors include his wife, Louise Gwinn Bailey; two daughters, Mrs. Joeline Phipps of Ft. Smith, Va., and Mrs. Mary Kathrine Hudson of Ocala, Fla., two sons, Alfred James of Flint, Mich., and Joel E. Bailey of Xenia, Ohio; one sister, Mrs. Pearl Edds of Huntington; 15 grandchildren and 6 great-grandchildren. Friends may call from 4 to 9 p.m. Sunday.